The NetSuite business management suite lets businesses manage their business in the cloud. Cloud Elements makes NetSuite integration easy. NetSuite helps thousands of companies manage and plan various aspects of their business in the cloud. But to get the most out of a NetSuite integration, you also need to integrate and share information from many other sources, including CRM systems, Human Capital systems, or your own applications - something that can be easier said than done! In this post, we’ll discuss some of the general and technical details that you’ll need to know in order to successfully integrate your applications with NetSuite, as well as some of the complexities you need to be aware of as you plan your integration projects. NetSuite is a unified business management suite, encompassing ERP/financials, CRM, and eCommerce. NetSuite bills itself as the world’s most deployed cloud Enterprise Resource Planning (ERP) solution, used by more than 40,000 organizations across 160+ countries. NetSuite’s offerings include the NetSuite ERP, which is the world’s most deployed cloud Enterprise Resource Planning solution, and NetSuite OneWorld––an integrated, cloud-based ERP application suite designed for global businesses. 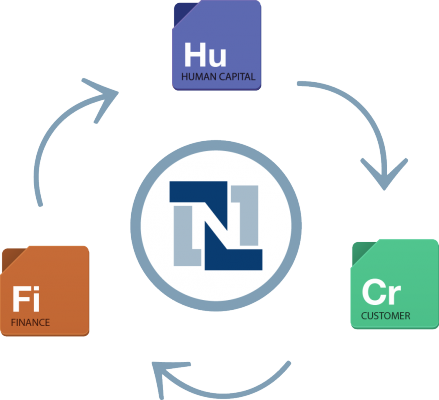 NetSuite has also “productized” its approach to application integration and extensions. NetSuite offers a technology platform that provides the tools to allow customers, partners, and developers to customize NetSuite to meet specific business needs. SuiteTalk: SuiteTalk is a Web Services integration tool that allows NetSuite to be integrated with legacy systems and third-party applications. SuiteTalk allows developers to use any programming language or platform that supports the SOAP standard in order to generate NetSuite business objects in that language. Third party integrations - while supported by NetSuite - can be fraught with challenges. The SOAP interfaces offered can be difficult to develop against and don’t integrate well with other cloud-native applications you may be using. While NetSuite offers an API, integration may not be key competency within your organization. Mistakes here can be costly if they affect important client or financial information. Integrations with SaaS applications need to consider the evolving nature of these platforms, including how APIs may change over time - potentially breaking your NetSuite workflows. Consider the platforms you need to integrate with - if you are building a web and mobile app integration you will probably want an API transformation service to turn the NetSuite SOAP API into a more developer & web friendly REST interface. The risk is that if your organization doesn’t have a good understanding of what you’re trying to accomplish, significant experience in business process improvement, as well as a good understanding of the in's and out's of application integration, you could find yourself in hot water. To avoid issues, businesses that don’t have significant experience in these areas should look towards an API integration platform for help. As you move more of your business to the cloud, it’s critical that your new cloud applications are well integrated with one another, and with any existing business applications behind the firewall. Integrate to our CRM Hub to share contacts, companies, leads, lists and more across all of the cloud CRM services you use. Integrate to our Finance Hub to track customers, vendors, invoices, payments and more across all of the cloud Finance services you use. Integrate to our Human Capital Hub to track employees, requisitions and more across all of the cloud human capital management services you use. Sick of SOAP? We make it easy to integrate NetSuite through our REST API! By deeply integrating each of your enterprise applications with one another, every member of your team will be equipped to make data-driven decisions and gain visibility across the business. Has your organization integrated any third party applications with NetSuite? How did it work out? Get in touch on Twitter!